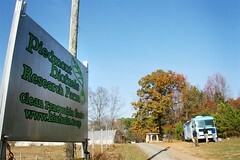 Piedmont Biofuels, located near Raleigh, NC is one of the pioneers in backyard biodiesel production…and they are only the second coop we’ve seen that offers B100 (100% biodiesel). We stopped there on our way through and chatted with them for the afternoon. They have a great facility with gardens, a cob house, a straw bale house, biodiesel production house (of course! ), intern housing, and a great tree swing (weeeeee!). We had fun talking with everyone and enjoyed the beautifully sunny day. We were delighted when they generously offered to donate 20 gallons of veggie oil to us…as well as a big bag of organic bell peppers from their gardens. Yay! Several people on our journey suggested that we make a stop at PrairieFire BioFuels Cooperative in Madison. We swung by there this week and chatted with Jeff about our tour, Shaklee (he and his wife have been distributors for 13 years! ), biofuels, and biodiesel vs. straight veggie oil. 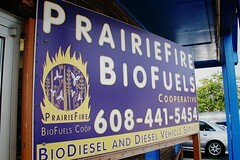 As far as I know, PrairieFire is the the only pump in the Midwest that offers B100, which is 100% biodiesel. Elsewhere, you can only find B5 or B20 (5% and 20% biodiesel). There are located on a very busy road in Madison, and they are doing a great job getting the word out there about alternative fuels! There is always a lot of confusion between biodiesel and straight veggie…but they are really very different. Biodiesel is made through a chemical process called transesterification, whereby the glycerin is separated straight vegetable oil. The process leaves behind two products — methyl esters (the chemical name for biodiesel) and glycerin. Straight veggie oil is just what the name implies. Straight…with nothing added or taken away. Just filtered. In a nutshell, biodiesel uses a chemical process to change the viscosity of the fuel and straight veggie uses the excess heat from the engine to change the viscosity and runs it into a heated tank, through heated lines. Or to put it another way, when you run biodiesel…you’re converting the fuel. When you run SVO, you convert the fuel lines/tank. And of course, as with anything new and “unknown”…there is controversy. There are political and ethical issues when you are raising large crops of food to turn into fuel (i.e. soybeans)…which is what many of the large biodiesel companies are doing. What started off as a grass roots movement…using waste (recycled) oil as fuel, has now been commercialized and could potential harm the environment in the process of making a product that is supposed to benefit it. We chose to go the route of straight veggie because of the financial cost, there are no chemicals are involved in making it, and it’s clean burning. The overall cost, even including the veggie system, was still much cheaper than filling up on biodiesel for a cross-country tour. Don’t get me wrong, biodiesel is still much, much better than running petroleum gas in your car. But it does still cost a lot of money! Straight, waste veggie oil is free…the only cost you pay is the initial cost of the system and for filters. It also comes down to convenience. When you are driving on SVO, you can’t just pull up to the tank and fill up…and be done in 5 minutes. There is planning involved, and you might get your hands a little dirty (gasp!). Biodiesel can definitely make sense for someone who rarely drives, but still wants to make a difference and “clean up” their footprint. It’s a long and lengthy discussion…and there is a lot of information on in the internet already about this debate. There is no silver bullet that will fix our transportation issues…there are so many different options out there. In my opinion, anyone who is making an informed decision to live greener is doing good. SVO is the way that we chose because it made the most sense to us. Research for yourselves and make the best decision for YOU. Rock on, PrairieFire BioFuels…keep spreadin’ the love!